This weekend, I had finished a commission order on pearl jewelry. 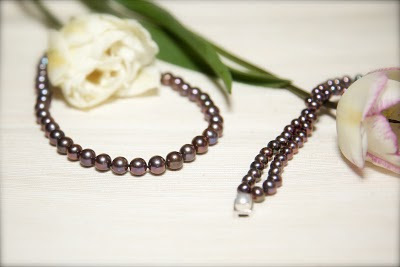 Lustrous freshwater pearls to create simple yet classic necklace & bracelet. After that, I made a cheesecake for my family as always. 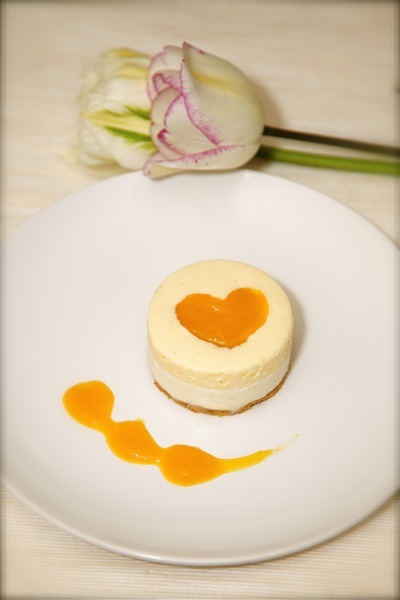 The cheesecake is made of 2 layers: mango & coconut. It seemed to be a great combo in my mind but the subtle taste of coconut didn't quite stand out. It's smoother & richer when served without the mango cheese layer. However, with the mango layer, it's fruity & refreshing. 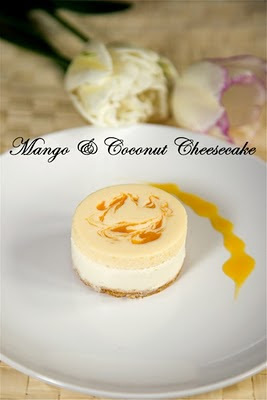 Want to try make the coconut cheesecake again. The decoration is simple but the end result is rather stunning. Mix the crust ingredients & press into a pan/ramekins, cool in a fridge. Dissolve the gelatin in coconut milk over simmering water. Whisk cream cheese & sugar until smooth. Whisk the whipping cream to soft peaks, fold in the cheese. Fold in the coconut milk. Fill in the prepared pan then refrigerate to set. Dissolve the gelatin in water over simmering water. In a large bowl, whisk cream cheese, mango puree & sugar until smooth. Whisk the whipping cream to soft peaks, fold in the mango cheese mixture. Fold in the gelatine solution. Pour over the coconut cheese. Spoon some mango puree on top & use a knife to cut through the batter in random motion for the marble effect. What a wonderful combination of flavors! Cute as well! How can I make this into 12 mini cheesecakes?